A Gift Worth Keeping: It Goes with My Décor! I wrote a book! 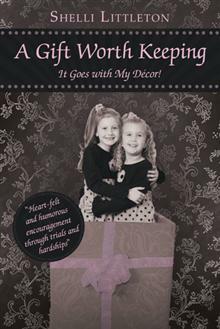 Friends, I am so excited to say that my book, A Gift Worth Keeping: It Goes with My Décor! is finally off my computer and into print! I wrote this book in 2007 and have been slowly editing and working on it through the years. This is my story of surviving hardships, and I pray it might encourage others. My prayer is that one would walk away with at least two things: (1) a different way to view hardships and (2) a real course of action to take to survive them victoriously. I was blessed to speak on my book to my wonderful San Angelo church family years back. I will never forget a precious lady coming up to me afterwards … she wanted me to know that she had lost three children. Horrible tragedy. Yet, she was encouraged by this message. Though tragic, I cannot relay how my heart leapt with joy knowing God had used this simple message to encourage. To encourage her. Please keep this little work in your prayers. I can’t tell you how much I have prayed on my face over this work. And know this is no money-maker; I have a ton invested in it. But I am asking God to use it, and my heart’s one desire is that God be glorified through it. It is out on Amazon and Barnes and Noble already. If you find it worthy, I ask you to please pass it on to anyone you know struggling through hardships and needing encouragement (this would make an endearing Christmas gift with Jesus’ birthday just around the corner). Most of you know I went through infertility, the adoption process, a miscarriage (tubal pregnancy), and our youngest baby girl surviving a Wilms tumor (cancer, chemo, the works) at only 13 months old. This book describes how I personally survived, and how anyone else can survive hardships. One doesn’t have to have gone through the exact hardships as I to be encouraged by this message. Writing this book was the most amazing journey with God I have experienced to this point in my life. This work has my heart and my tears all over it. And it is girly in every way (sorry guys!)! Blessed by you, and there is no way to relay what your support would mean to me. ps. If you read this book and are blessed in any way, I’d love to hear from you. Shelli! I'm so proud of you! You've had this on your heart for so long! Rejoicing with you and praising God for His story written in your life!! I love you!!! Shelli – my book arrived and I am so thankful for this wonderful gift from your heart. I can't wait to read and get to know you better through the pages. And most of all, to know Him better. You shine for Jesus – thank you. Precious Jan … I can't begin to tell you what that means to me! I love you so much. love you momma!!!!!!! and your book! I love you, too, Katelyn Grace! Hi this is Karalee… Love you Momma! Very proud of you for writing your book. Night.! Ha ha! You girls are funny!! I love you both! A friend told me about this book. I'm hoping to find it at Barnes and Noble tomorrow. And hoping it helps me. I go to a church you used to go to, Travis Avenue. I've lost my sister, my dad and recently my mom. It really hard because I was never alone and now I'm suddenly alone. And Karen, I will be praying that God will use my book to minister to your precious heart. And if it does minister to your heart, please let me hear from you. I love you, Karalee. Thank you, Darling.